Fusion SP pour basins provide long life and thermal insulation for your molten metal pouring needs. Rex Materials has developed a family of fused silica products. 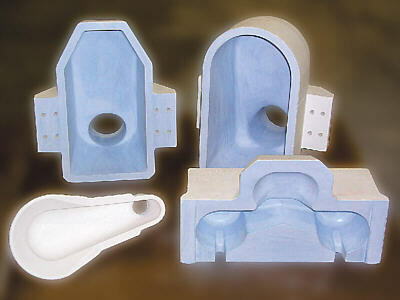 Fusion SP was specifically developed for pour basin applications. Pour basins can be ordered with a special BN coating to make them non-wetting to aluminum and other metals. Long life, thermal shock resistance and thermal insulation are the key characteristics of Fusion SP pour basins. Fusion SP Pour Basins can be manufactured to your exact specifications or our team of engineers can design one for you. is made from fused silica that has been sintered to a high temperature. Today they are used in many non-ferrous applications, including but not limited to, tap blocks, trough liners, filter bowls, flue port blocks, pour basins, spouts, control pins, and dipping ladles. Rex Materials' ability to supply quality shapes cost-effectively enables you to use parts in applications where ordinarily fused silica products have been too expensive. SP pour basins are made with a unique process allowing us to be very cost effective. SP pour basins come in sizes up to four feet wide. Standard or custom designed pour basins are available.